Rotary Clubs throughout Cumbria & Lancashire have been busy fundraising to provide support in the aftermath of the disaster in Nepal. In emergency situations it is crucial that people not only have shelter but can access safe water. Without these measures, outbreaks of diarrhoea, cholera and typhoid pose a serious risk to survivors long after the tremors have stopped. Medium to long term support will also be required to help rebuild the communities. In Ambleside, many local businesses and visitors have first-hand experience and connections with the Nepalese area and were keen to support Ambleside Kirkstone Rotary in their fund raising activities. Ambleside Kirkstone Rotary club collected donations and demonstrated to visitors at a local garden centre in the use of a simple water filter device, part of the Aquabox. Also on show was a Shelterbox which typically includes a disaster relief tent for a family, thermal blankets and groundsheets, water storage and purification equipment, solar lamps, cooking utensils, a basic tool kit, mosquito nets and children’s activity pack. Over £4,000 was collected in donation buckets for the purchase of Shelter & Aquaboxes. Rotary assures donors that the resources sent are getting to where they are most needed. Great Harwood & Rishton - raised over £772 for the people of Maikot Village. Kendal and Kendal South Westmorland - Kendal RC collected in Booths, Kendal and donations from customers of Spar in Staveley. Donation from Kendal South Westmorland RC. 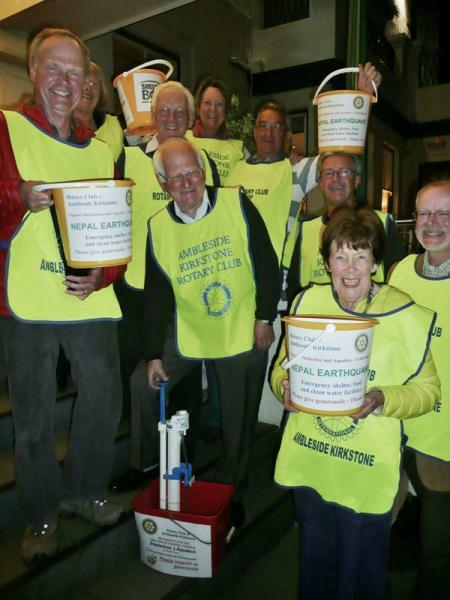 Total of £1776 being sent to Rotary Distrct 3292 in Nepal. The clubs have previouly donated to the Khiraule School in this District and have good links. Click here for details. They have heard that the village has not had any tremours but that sadly two Sherpas from the village died on Everest.